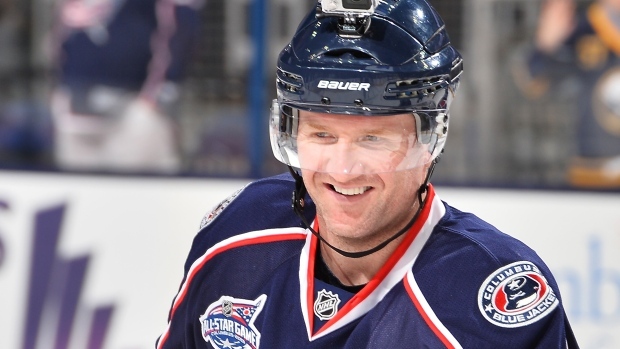 The Columbus Blue Jackets have bought out the remaining two years of Scott Hartnell's contract, the team announced on Thursday. The veteran winger had two years left with an average value of $4.75 million on his six-year pact with the Jackets. "On behalf of our organization, I want to thank Scott for his contributions to the Blue Jackets over the past three seasons and wish him well in the future," said general manager Jarmo Kekalainen in a press release. "Moves like this are never easy, but with our current organizational depth at the position it is something we believe is in the best interest of our club moving forward." The buyout will cost Columbus a cap hit of $1.5 million in year one, $3 million in year two and $1.25 million in the final two years, according to CapFriendly. It also saves $3.25 million in cap space for the upcoming season, giving them a total of $12.887 million to spend on players. #BlueJackets buying out Scott Hartnell saves the club $3.25M on their cap this season, giving them roughly $12.887M in projected cap space. Hartnell, 35, had 13 goals and added 24 assists over 78 games with the Blue Jackets in 2016-17, his third season with the club. He also appeared in four playoff games, failing to record a point. The Blue Jackets acquired the Canadian from the Philadelphia Flyers in June 2014 for RJ Umberger and a fourth-round draft pick. Selected by the Nashville Predators sixth overall in 2000, Hartnell has scored 314 goals and 370 assists over 1187 career games in the NHL with the Preds, Flyers and Blue Jackets.